Line the first bowl with aluminum foil, shiny side up. Be sure the foil hangs over the sides of the bowl. Fill the second bowl with clean cold water. Place a double layer of paper towels on the counter next to the second bowl. 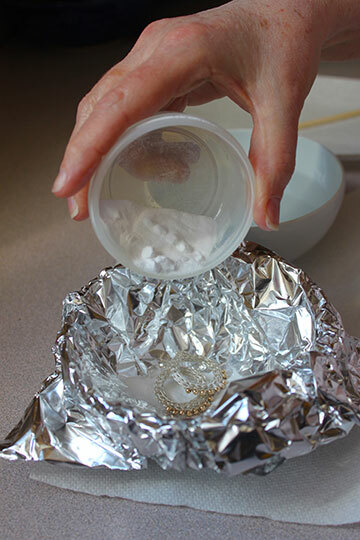 Place your sterling silver or gold filled jewelry evenly in the empty foil lined bowl. Put fresh water in your teakettle and turn it on to boil. Sprinkle 2 Tablespoons of baking soda over the jewelry* and pour in just enough boiling water to cover all of the jewelry. Adding the boiling water will cause a bubbling fizz. Let it sit for about one minute. The water may appear cloudy with the residue. 4. Using a clean wooden chopstick, carefully remove and transfer the jewelry from the very hot water into the bowl of clean cool water and rinse well. Lay the jewelry on the paper towels and pat dry or air dry. If the jewelry was very tarnished you can repeat the process immediately. 5. Sterling silver jewelry that is mixed with 14k gold fill can also be cleaned using this method. Jewelry that features intentionally oxidized (blackened) sterling silver should not go through this cleaning bath as it will lift away the oxidization. 6. *Please Note: Jewelry with pearls and hard gemstones can go through this cleaning method. Soft gemstones like turquoise, iolite and apatite should not be exposed to this cleaning process, as it may cause damage to them. If you are in doubt of the softness of a stone refer to a gemstone chart. 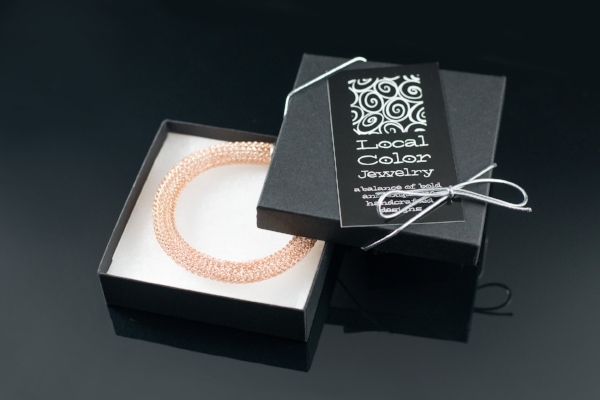 Local Color Jewelry uses only the highest quality of 14k Gold fill. 14k Gold fill is a heavy layer of 14k gold pressure bonded over brass. Gold fill is not to be confused with gold plating as gold-filled has 100 times more gold than gold plating. 14k Gold fill items are generally considered lifetime products and the outer gold layer will not wear off as it will in electroplated products. Anyone who can wear gold can wear 14k Gold fill without worries of allergic reaction to the jewelry. Caring for 14k Gold fill items is as easy as caring for any gold jewelry. Clean regularly with mild sudsy water, rinse well, and pat dry with a non-scratching cloth. Polish gently with a jewelry polishing cloth. You can use the cleaning method above for sterling silver and 14K gold fill jewelry. We recommend storing cleaned and dried handcrafted jewelry in individual airtight zippered plastic bags, a jewelry pouch or a cotton lined box. This will cut down on tarnish and keep it from becoming scratched or tangled with other pieces of jewelry.